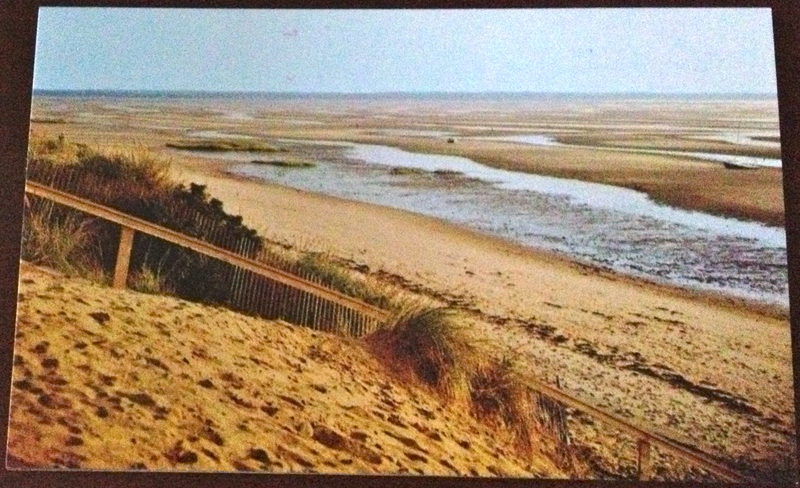 I’ve posted quite a few photographs of Cape Cod sand dunes from vintage postcards. This is the first in black and white. The postcard was printed during the era when it only cost a penny to mail a postcard and have it delivered anywhere in the United States. Notice all the beach grass and vegetation growing on these sand dunes at the end of the 19th century. When the National Seashore took possession of acres of seashore on Cape Cod, which included sand dunes, during the last three decades of the 20th century they grappled with erosion. Much of the natural vegetation had been destroyed by tourists eagerly dragging coolers, umbrellas, and beach towels to set up their spot for relaxing by the water’s edge. And then there were all the children exuberantly running and sliding down sand dunes. Temporary fences were erected and new dune grass was planted. While once there was a parking area by Pilgrim Lake on the way into Provincetown for tourists to stop and walk the dunes, that parking area was closed and blocked off. Why? Just too many people causing the vegetation to become damaged and rampant erosion taking place. The wind blows hard and the sands shift and change. So it is with stories and tales of Cape Cod and Provincetown. 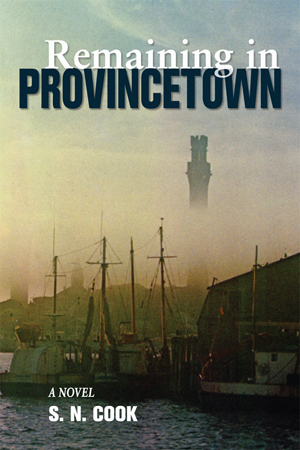 Read any Provincetown books lately which capture the flavor of what it’s like to live in the town? Remaining in Provincetown by S.N. Cook is awaiting your reading pleasure. Available in bookstores and online as a trade paperback or ebook. Like us on Facebook. Keep the conversation going. Race Point Beach in Provincetown, now a part of the National Seashore is a favorite spot for swimming, fishing, and nature watching where one might catch a glimpse of a seal or whale, depending on the season. But Race Point is also the site of many shipwrecks and between 1873 and 1902 had a Lifesaving station known as Race Point Station. 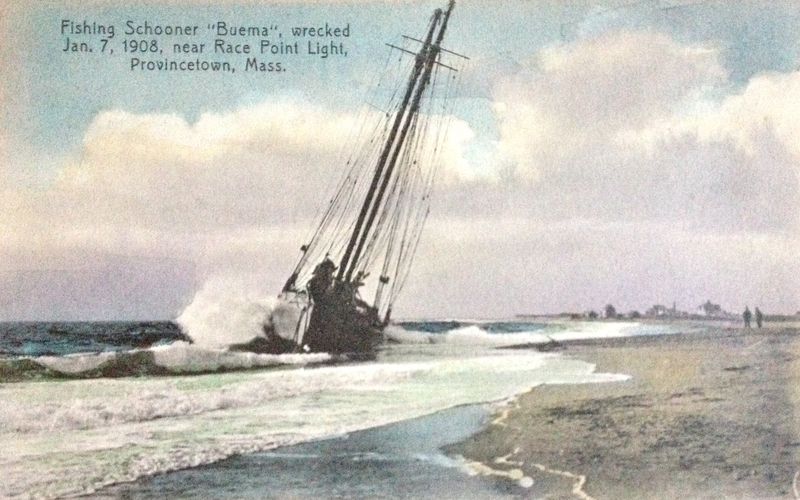 Unfortunately the station was no longer in operation when the fishing schooner Buema crashed into the surf and was wrecked on January 7, 1908. The above postcard, purchased in 1924 tells the story. During the time the Race Point Station was in operation they had three surfboats which aided hundreds of seafarers. Among the names of men who served at the lifesaving station and lost their lives aiding others were Captain Dave Atkins and Frank Mayo. Is that where the name for the road Atkins Mayo, the dirt road where two characters in the mystery novel Remaining in Provincetown live, comes from? Curious to read the new murder mystery set in Provincetown, the book everyone’s talking about. You can pick up a signed copy at the Provincetown Book Shop while they last or buy a book online at Amazon.com in trade paperback or ebook. 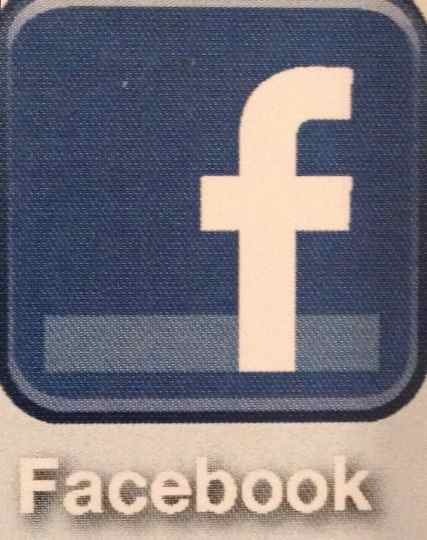 Like us on Facebook and keep the conversation going. Long Point, the very end of the Cape has a lighthouse and a secluded beach. Going to the beach on Cape Cod offers so many choices. 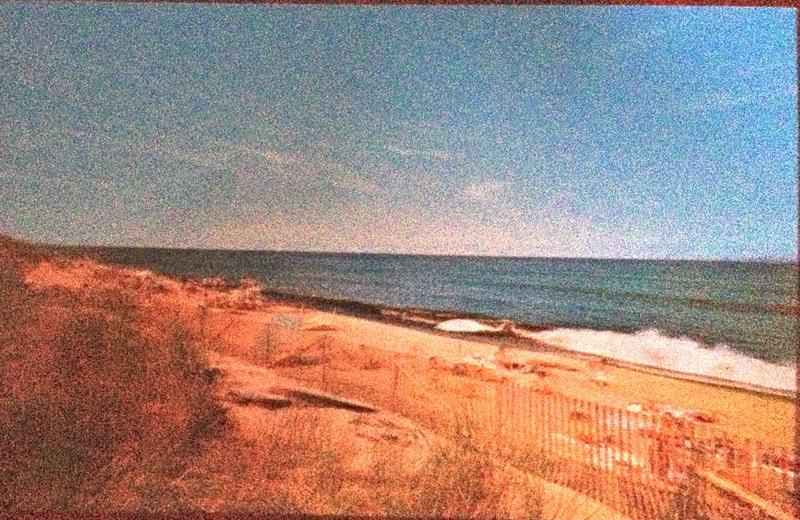 There are the National Seashore beaches and the various town beaches, but without a beach sticker your options are limited. If you can make your way out to Long Point, at the very end of Provincetown, either by boat or by walking across the breakwater there is a beautiful unspoiled secluded beach and the opportunity to shed your clothes if the area is not tightly patrolled. In previous blog posts I’ve talked about the clothing optional sections of Herring Cove /New Beach. The other place to visit is beautiful Long Nook in Truro. If you walk down the beach to the right, you’ll start to notice it has become clothing optional. During the summer season, you will need a beach sticker from Truro which you can buy if you are renting property for the week or month. Otherwise you could try bicycling there… Perhaps readers may have some other suggestions. Now when you do get to the beach of your choice, what book did you bring to read? I’m hoping you brought a copy of Remaining in Provincetown, the new mystery novel that everyone is talking about with all those almost familiar characters. Like us on Facebook. Currently on sale at the Provincetown Bookshop and online at a variety of sites in trade paperback and as an ebook. What’s your favorite beach? Provncetown Bicycle trails near Race Point Beach Cape Cod. Built in the 1960’s the bicycle trails on National Park Service lands take you across the sand dunes to the Beech Forest, Province Lands Visitor Center, Race Point Beach Parking lot and Herring Cove Beach Parking lot. The loop trail is almost five and half miles in length. On your drive along the steep winding trails you will see beautiful vistas of sand dunes as well the native vegetation which includes wild roses and beach plums along with the grasses that have been intentionally planted to help retard the shifting sands that cause dunes to shift and change shape each season. If you are lucky, in the off-season you may encounter a fox. In summer there are small toads around Bennett Pond. Don’t have a bicycle? You can rent one in Provincetown for a few hours or a day, to explore the trails. Bring a towel, bathing suit, and plenty of water as well as a picnic, if you’d like to enjoy a daylong adventure. People of all ages enjoy using the bike trails. The Carreiro children, in the recently released novel Remaining in Provincetown, can’t wait to get a hold of their bicycles so they can go riding on the trails, even if it is early spring—way too early for swimming. Want to gain a better insight as to what it’s like to live in Provincetown because you are planning a visit? Remaining in Provincetown by S.N. Cook makes a great beach read, or start reading it now in anticipation of your vacation. Now available at local bookstores, online and at Amazon.com. Like us on facebook. Show the big publishers you can make your own decisions on what to read. Join the conversation. In 1910, the automobile was still a relatively new luxury form of transportation. If you owned one, it was a treat to take a driving tour out to the very end of Cape Cod and visit the beaches, sand dunes, and town of Provincetown. 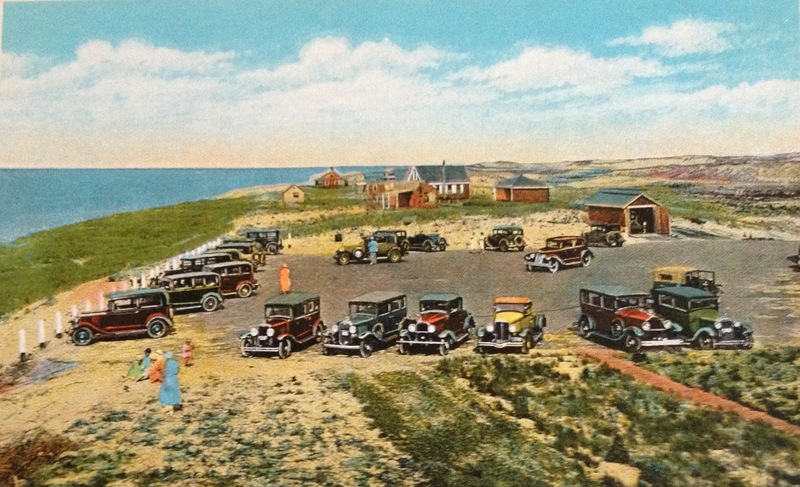 This antique postcard shows the parking lot of the Race Point Coast Guard Station (now part of the National Seashore) on a clear sunny day with all of its original buildings. It’s still a great place to visit today, and summer is almost here. Want to get in the mood for your visit? Read the new novel, Remaining in Provincetown by S.N. Cook now available online and in bookstores and at Amazon.com in trade paperback and on kindle. Like us on Facebook. 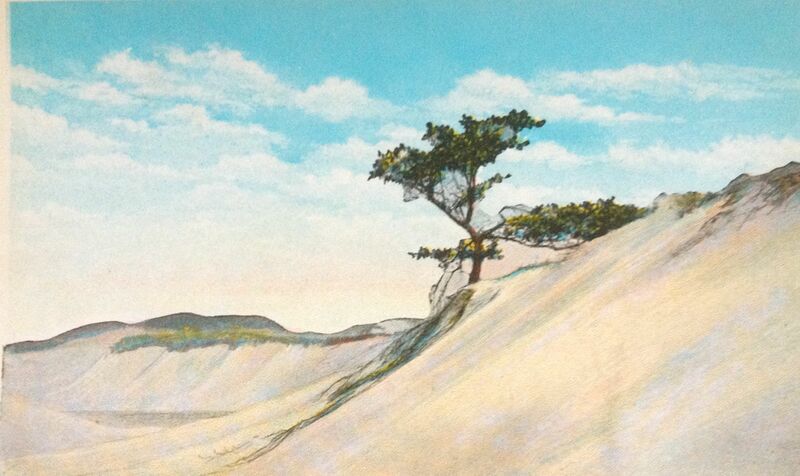 Provincetown’s sand dunes, now part of the Cape Cod National Seashore, have inspired many artists. One writer, closely associated with the dunes was Harry Kemp,(1883-1960) who was fondly referred to by the summer and year-round residents as “The Poet of the Dunes”. It is likely Kemp helped promote that name for himself, as one of his poetry collections he self-published in 1952 was entitled Poet of the Dunes. Here is one of his short poems. And wears glory on its back. Born in Youngstown, Ohio, Kemp first arrived in Provincetown in 1916. His memoir, Tramping on LIfe: an Autobiographical Narrative (1922) was a bestseller during the 1920a and 30s. He was part of the elite circle of bohemian writers of his era that included Upton SInclalir, Max Eastman, Eugene O’Neill, Edmund WIlson, John Dos Passos and many others. Setting down roots for a time in Greenwich Village, In the late 1920’s he started spending his summers in a Provincetown dune shack. A heavy drinker and a womanizer, he was a master of self-promotion, performing stunts for the press in order to garner publicity and attention. 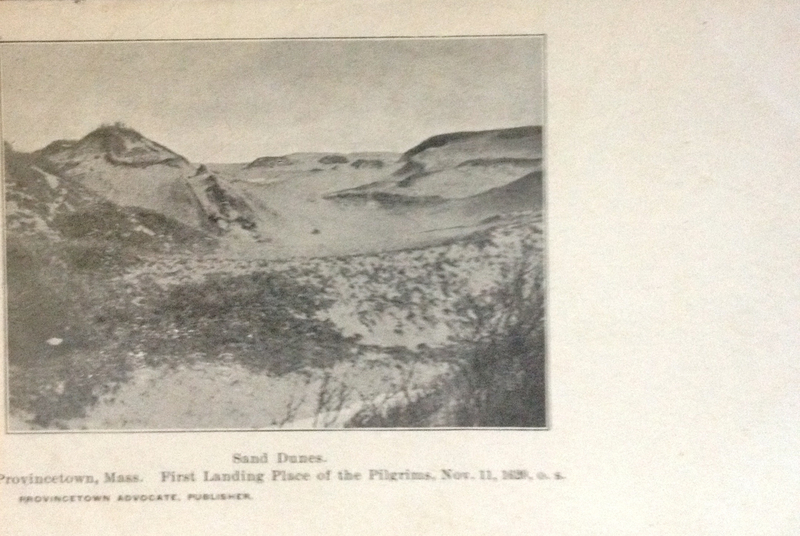 Eventually his literary popularity waned, and when he could no longer find a publisher for his poetry, he founded the Provincetown Publishers and had his books printed by the Advocate Press which he sold for two dollars and autographed with a seagull feather along with an envelope of sand “gathered from the first landing place of The Pilgrims”. Now that is marketing for you! While the purchase of the new mystery novel Remaining in Provincetown does not include sand gathered from the dunes, it is the hope of the writer that when you read the book you will feel as if you’ve been walking on the streets of Provincetown, which usually results in a little sand in your shoes. Now available in trade paperback or on kindle at Amazon.com , Like us on Facebook and keep the conversation going. 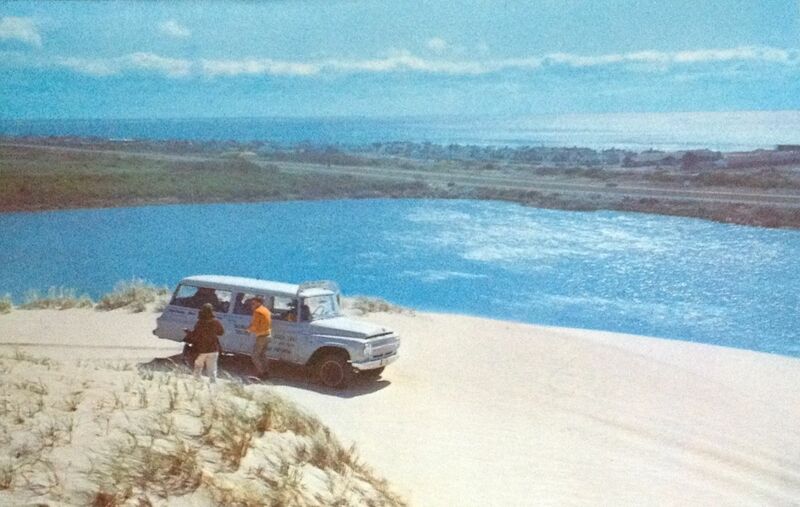 Before there was a National Seashore, four wheel drive vehicles could traverse the sand dunes at the tip of Cape Cod, traveling back and forth to visit dune shacks and go fishing. Tourists would pull over to the side of the highway and get out of their cars to run up and down the dunes as they approached Provincetown. 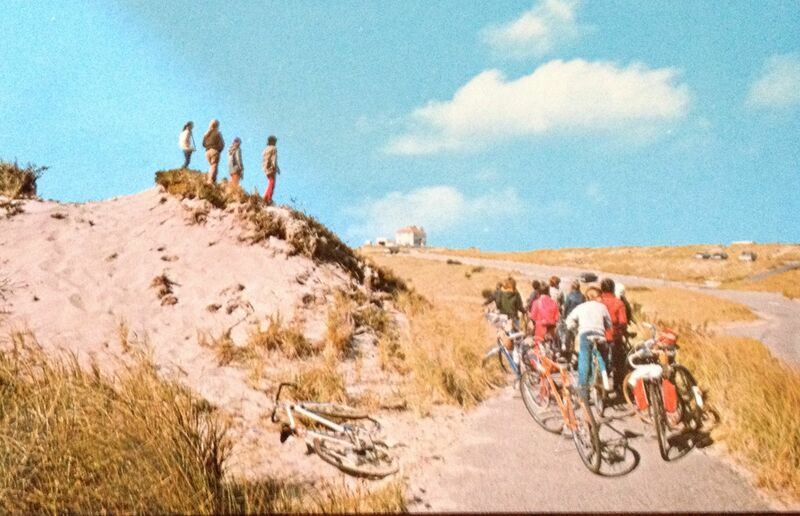 This postcard from the 1960s shows a Dune buggy tour on the sand dune above Pilgrim Lake, which you see as you approach Provincetown from Truro. Initially the National Seashore built a parking lot near Pilgrim Lake to provide a safe spot for visitors to park but quickly realized all the erosion damage taking place and closed the area. Dune grass has been extensively planted to help prevent more loss of the dunes. 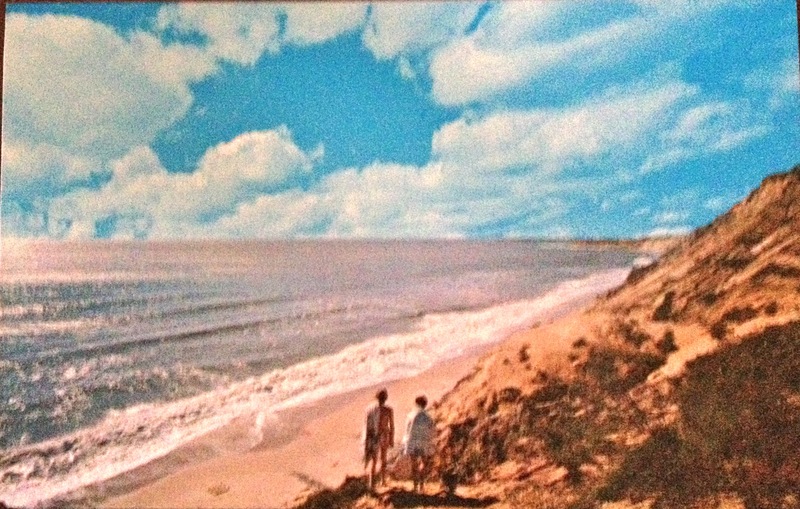 In 1946 Art Costa started Art’s Dune Tours and his son Bob Costa has continued the tradition of providing interesting educational tours that explain some of the historic highlights of the sand dunes that span from the back side of the town out to Race Point and the Outer Shore. You can walk the across the dunes by taking the path at Snail Road and hiking across the sand or you can enjoy the bicycle trails that cross the sand dunes as the Carreiro children do in the soon-to-be released mystery novel Remaining in Provincetown.